Hermann tortoise falls under the species Testudo. Three subspecies can be found, which are, western Hermann’s tortoise, eastern Hermann’s tortoise and Dalmatian tortoise. The shell of the eastern species is less highly domed compared to the western species. Hermann tortoises have brightly coloured shell which might fade as they grow old. Their tails have large scale or nail towards the end. 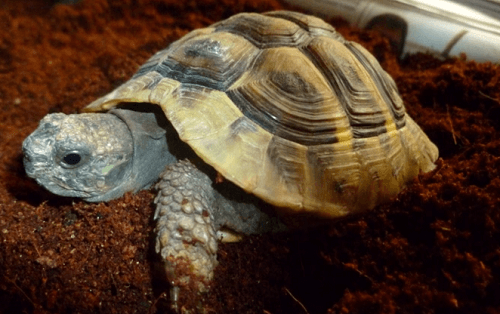 Hermann tortoise is very popular among pet lovers and is most common tortoise species to keep as pets. One of the main reasons for that is, they are very fun loving and fascinating. They can easily mix with human and it is very easy to know about their habits. The owners can make a bond with them and figure out their likes and dislikes in a short span. They usually live up to 75 years of age on an average. They are strictly herbivorous unlike Reeves turtles which are omnivorous and consume both plants and animals. One should never ever feed them meat as their system cannot handle protein and can stress their liver and kidney. Beans and peas should also be avoided. Their diet should actually be high in calcium and low in phosphorus. The best way to provide them enough calcium is by giving them cuttlebone, which are quite easily available in the pet stores or fishmonger. If you are providing your pet with improper diet, their soft-shell can be prone to pyramiding. Green leafy plants like weeds, grass, hibiscus, groundsel, watercress, leaves of roses, etc. should be chopped into salad and provided about five times a week. The females look for a well drained slope during the time of laying eggs. To provide an ideal breeding area makes a small heap of soil for your pet. The heap should be around 1 foot long and approximately 2 to 4 feet wide. This will work well for you as well as it will become easier for you to assemble the eggs afterwards. Your pet will create a burrow for herself and will lay her clutch there. There can be single egg or as many as twelve eggs in that clutch. Form an incubator of temperature between 26oC to 31oC. So, place the eggs in that incubator. With the help of the temperature of the incubator one can determine the gender of the hatchlings. If the hatchlings are born in the temperature around 26oC, males are born. If the temperature rises to around 31oC, females are born. If the temperature remains between 28o to 29o then the genders cannot be pre-determined. Hatchlings will born after being in the incubator for about 90 to 120 days. Hatching requires nearly the same care as the adult ones do. They will have to be provided with water supply in a tray for soaking and drinking. Provide them the calcium that they need to grow healthy shells. Once they are two-three days, you can start feeding them cuttle-bones and green herbs. As Harmann tortoise are naturally passive towards human, they can be very good as pets, especially for children.